I arrived at Ventnor after two and a half "interesting" years in Cyprus and although only a corporal at the time, as a fully fledged Provost Policeman I was senior enough to be in charge of the security. 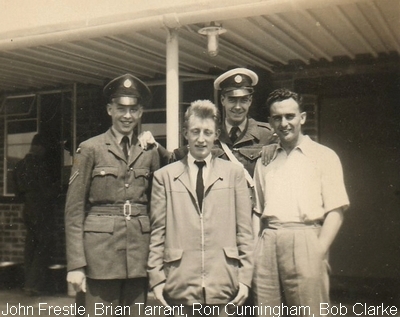 In those days there were two types of RAF policemen, the standard guys who only operated in guardrooms and us clever clog types who had earned the title of Provost, having sat numerous exams and undergone extensive training programmes and could operate anywhere. I took over from a Doug Riddle who was about to be demobbed and I understand he remained on the Island as did a few of the other policemen after their demob. I was already married and so lived out - in a lovely house in Lower Gills Cliff Road. I had arrived prior to the new domestic site era and remember the the transfer to it well. I most certainly remember the sites, recalling both the Rotor and A Site plus of course the Domestic Site at the foot of Down Lane. I used to organise the duty policemen on all three sites and if my memory serves me right there were about 12 of us in all. The Station senior NCO was a F/Sgt George Adams and the c/o was just a Flt/Lt. I think his name was Stevens. It certainly was a good posting and my time there was most memorable and relatively straight forward after the exciting all action period in Cyprus! A couple of my men who stayed on after I left in the late Summer of 1953, married local girls. My replacement was a Sgt Gallagher, but he wasn't there for long and was replaced by a mad keen golfing guy called Sgt Reynolds. My younger brother Brian was also a policeman at Ventnor and he remained there for some time after I left. The names of some of the other policemen were, Bob Clarke, Basil Rowles, Mike Humberstone, Pit Stoker, Ron Cunningham, Ernie Spicer, John Frestle, Harold Lines and "Tinker" White. To name but a few. There are also Dog Handlers whose faces I remember, but unfortunately not their names. When one thinks how quaint the town was with all the family stores and businesses there then, I reckon the closing of the RAF Station must have affected quite a few livelihoods. I have been back a few times, the last being in the 80's and there was no sign of the wreckage of the domestic site that now seems to be the case. 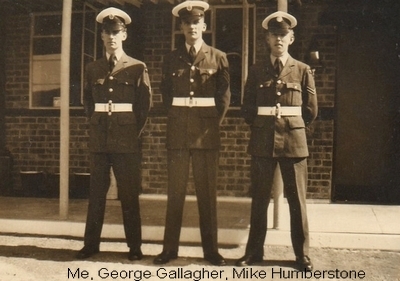 I noticed especially on this web site the photo of the guardroom which is unrecognisable. Very sad indeed! After Ventnor I served first at the Air Ministry and then had a job concerned with security at all the US airbases in Britain. I ended my 12 year engagement with the rank of Sergeant. On leaving the RAF I acquired a degree in Mechanical Engineering and became a Consultant/ Troubleshooter. I retired in 1994 and now live in France for half the year and will return there at the end of September .